On 23rd February 2012, the Greek parliament passed a Law which at the time went mostly unnoticed in one of its provisios: the retroactivity of the CAC (Collective Action Clause) for Greek Law bonds. Greek bonds holders who do not accept the debt swap will be forced to do so. 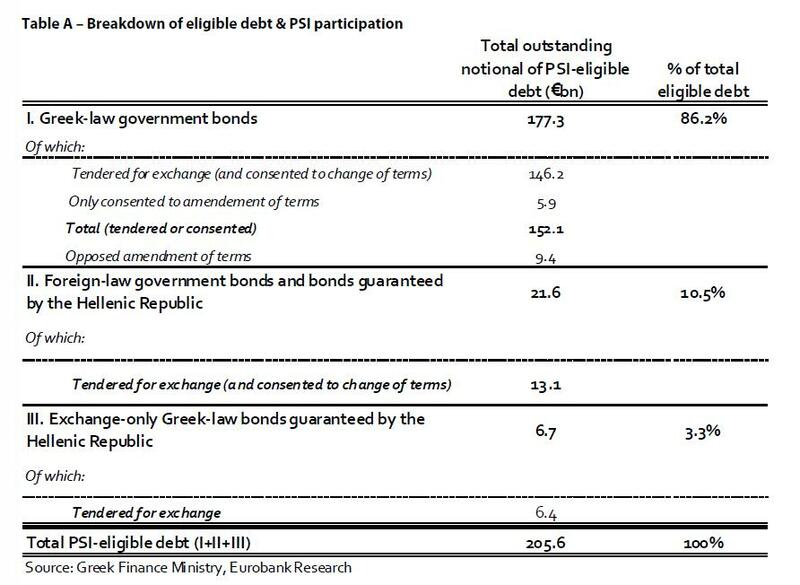 and EUR 20 bn of non-Greek law (69.9%), i.e. 83.7% for the aggregate. The invitation period (to the public offer) for each series of PSI-eligible foreign-law bonds and of bonds issued by state enterprises and guaranteed by the Hellenic Republic has been extended until 9:00 p.m. (C.E.T.) on March 23, 2012. Note that not only content to renege on past contractual agreements on Greek-Law bonds, Greece is threatening to default on bonds held under foreign (Brtiish) Law if bondholders do not accept the terms of the bond swap agreed (read forced) on March 8. I thought retroactivity of laws was the benchmark of totalitarian regimes, but no, it is happening in 2012 within Europe, in the birthplace of democracy. All European leaders are applauding to something they should utterly reject, but for futile self-political interest. There is one basic principle of democracies: the non-retroactivity of laws. I feel that any investor would successfully challenge this before the European Court of Human Rights.